I first started programming computers on an Amstrad in the 1980s using the BASIC programming language. I also began to produce music using first four tracks and then personal computers. By the early 2000s my live electronics set-up consisted of banks of guitar pedals, mixers and many many cables. The sheer weight of these was a real problem with travel and the choice of routing was limited. I decided to make the leap to software where I could design a customised, ergonomic and dependable set-up which would respond to my specific needs. In 2013 I completed a PhD from Dublin Institute of Technology which centered around designing new software to respond to my instrumental practice. You can read more about that here. 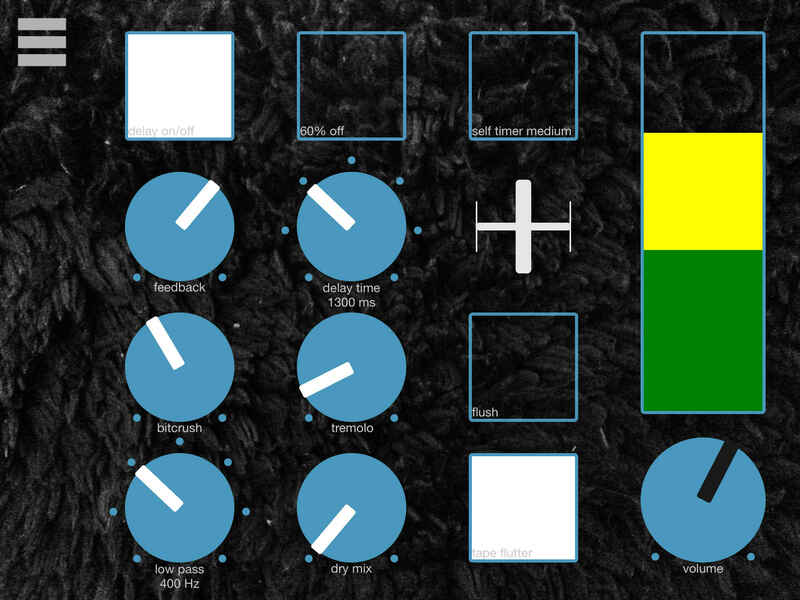 I designed software in Max/MSP which is freely available from this page. In 2018 I switched from working with Max to Pure Data. I'm much more drawn to Pure Data now for a few reasons. One of which is that I can run software on smaller devices. Below is an expanding collection of patches designed for phones and tablets which use the MoMuPlat app to run Pure Data. You are free to download, use, modify or ignore these. Today I design new apps for musicians to run on iPad/tablet or mobile phones. Programmed in Pure Data - an infinitely powerful programming environment - these are customised to exactly what the musician needs and work exactly the way the musician wants them to. If you're interested in commissioning me to make you one, get in touch. 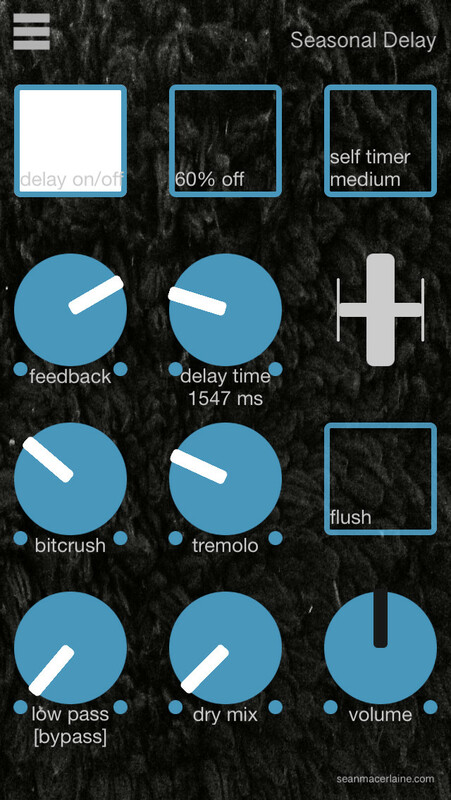 Digital delay with built-in bit crusher, low-pass filter and tremolo. 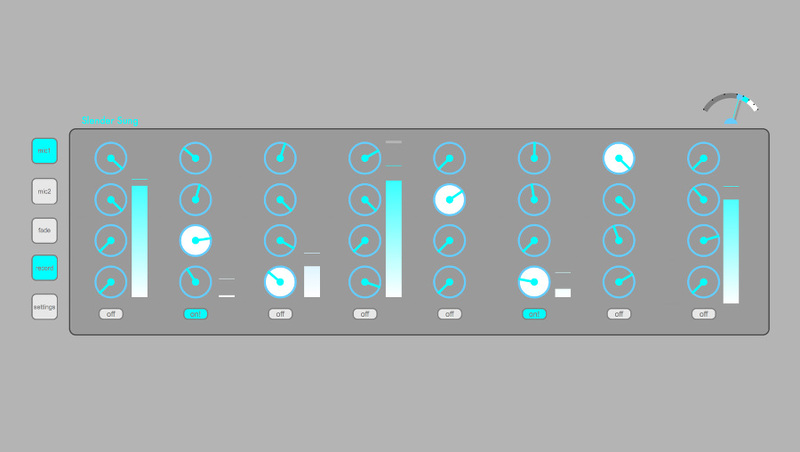 This effect module also includes a "self timer" function which disables the on switch after a period of time and a "flush" function which clears the buffer. Designed for iPad Mini and iPhone 5. Designed for control with Livid CODE, KMI Softstep and run on a headless Mac Mini. This software is written in Max 6 from 2013. The patch uses delays, spectral delays, pitch-shifters, reverb, live reverse, harmonizer, ring modulator, tremolo, extreme time-stretch and more. Some programming experience with Max will be essential to get this up and running for your set-up. All functionality and theory is explained in my PhD thesis. You can hear some of the many many many hours of music I made with this patch on my second solo album A Slender Song, which is a collection of live solo performances released in 2014.